As you can guess from its name, BookSpotter Enhancement Engine by Sztaki tries to find book occurrences in the processed content. To do that, right now it relies on the downloadable data sets of the British National Bibliography (BNB) and The Open Library (OL). However, it could use potentially every catalog which title list is downloadable. Once BookSpotter finds something, it will insert an entity to the analysis result that points to the correspondig catalog item on BNB or OL. BookSpotter loads a list of titles (currently we are working on a set of 5.6 Million titles) into memory and each time a text comes in it runs trough it, checking its tokens agains its memory database. Once a title mentioning is found, an SQL database is consulted to get the authors of the work in question. If one or more authors appears to be present in the text it will add a TextAnnotation and an EntityAnnotation for it, with a confidence value that is generated heuristically from the author occurrences. Let me share some considerations that led me to choose this architecture. Maybe you will notice that according the algorithm sketched above, a book will only be spotted if there are at least one part from the author string there, too. Yes, there are plenty of cases where the author is not there, only the title. On the other hand the majority of everday words are also titles. If you look up the words from the previous sentence I’ve just written you will get the idea. Therefore, restriction is needed. We also rely on the case (Upper/lower) of the words, but of course, that also is language-dependent, e.g. in German it won’t help a lot. Overall, the two data sets together contains more than 47 million titles. Of course, there are some errors, redundancies, some titles that are too specific and unlikely to be spotted for one reason or another, and also there is a strong need of reducing the size of the data set. The Early Adopter Programme (EAP) allowed me to hire some summer work hours from the TU Budapest’s Student Work Association for the manual evaluation of 5000 book records from which we could get a picture about the whole data set. Together with the really helpful student we have learnt that the following problems need our attention. After filtering the problematic recors we had a smaller data set, which still contained a lots of entries we felt should be ommitted. Think about titles that describe the statistics on national agriculture in a certain year’s certain quarter, or the log of a certain day of a certain parlament issued as a volume. True, one day one might refer to just these items. However, given that right now we needed a still smaller data set we have made a further filtering. After manually investigating lots of records we maximalized the lenght of the titles in 6 words and left out the rest. This reflects our admittedly questionable perception that titles that are longer than this are usually not the ones that will be very rarely discussed on the internet. (of course there are sad exceptions that have been filtered out this way) So this how we get the 5.6 million titles. For the functional evaluation we have used 25 texts collected on the internet that contained book descriptions. You can try the BookSpotter out on our Stanbol instance. This database is used to check whether the author-candidates and the title-candidates match. Altogether it contains about 13 Million entries. This contains one work id/title pair on a line. Why duplicating the data that is already in the SQL? Because all the titles will be loaded into the memory, and that cannot be done directly from the SQL database without generating some really serious stress on the database server. Download and Insert the SQL into a mysql database instance. Download the titles file and put it to a location on the server which can be reached by stanbol. 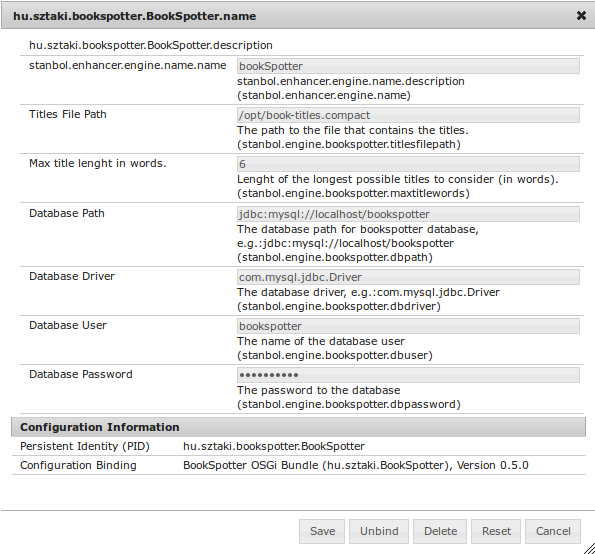 Install the CasLight, BookSpotterLib, BookSpotter, bundles and the mysql connector jar to stanbol trough its system console. 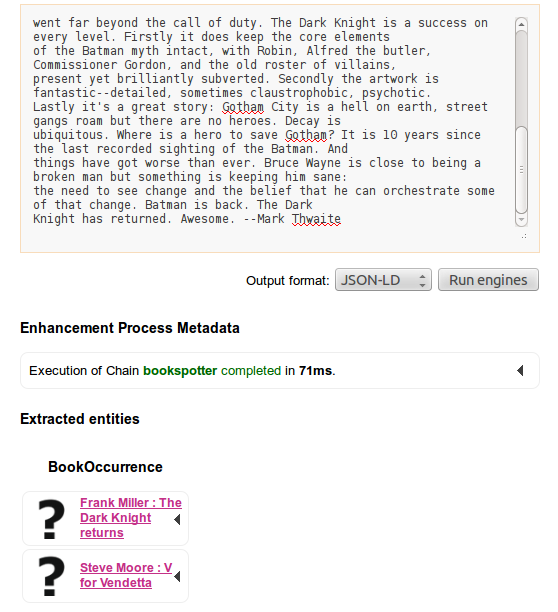 Configure BookSpotter with the database access information, and the path for the book titles. I hope you will enjoy using BookSpotter.